This comfortable and fully-escorted and guided safari tour through Rwanda features lands of rolling hills, tranquil lakes, rainforests and jungles, gorillas and other primates, and glorious butterflies outnumbered only by the plentiful birds. We make route for Dian Fossey’s stunning Parc National des Volcans, where we embark on a trek to encounter the mighty mountain gorilla and follow one of five gorilla families. Day 1: Arrival and transfer to Kinigi for your Gorilla Tracking Airport transfer with private vehicle and guide. Depart from Kigali city with a private vehicle and guide. Transfer to Volcanoes National Park the home of gorilla tracking activity in Rwanda with private vehicle and driver.gorilla-tracking-uganda Ranging in altitude from 2400km to 4,507 the Volcanoes National Park (French: Parc National des Vulcans) is dominated by the setting of volcanoes after which it is named. Best known to the outside world as the place where for almost 20yrs the American primatologist Dian Fossey under took her pioneering studies of mountain gorilla behaviour. Day hikes to see the gorilla families can be strenuous on tracks climbing through the forest, and time is very limited once contact is made with the gorilla families. It is a rare and memorable experience to visit with these giant cousins of man. 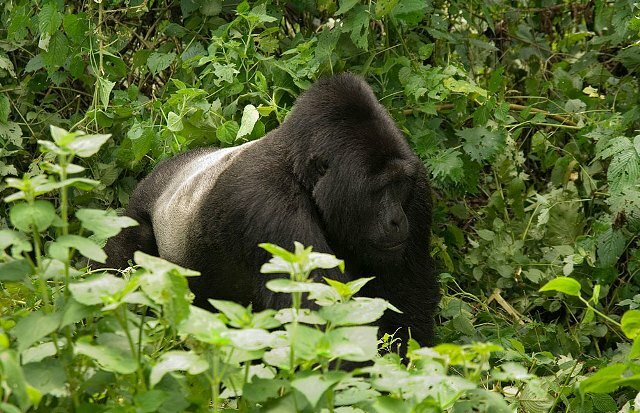 Our accommodation is ideally positioned for those who want to watch animals in their habitat, specifically the endangered Rwanda Mountain Gorillas that still roam these areas. Accommodation options available (all on full board basis) Up-market: Gorillas Nest Lodge, Mountain gorilla view lodge Moderate: La Palme Hotel or Volcanoes Gorillas Hotel Low Budget: Kinigi Guest House. Meal plan The cost of the tour includes most meals. Please check in the program what meals are included with your choice of accommodation.